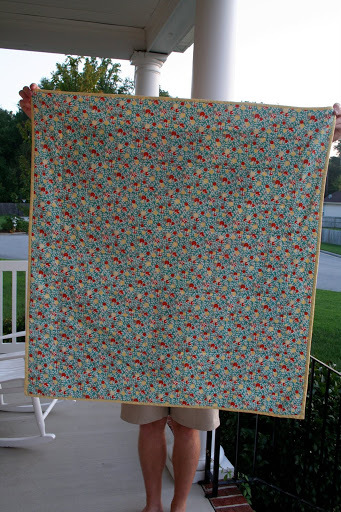 I finished this quilt just two days before Baby Zoe was born. For the sake of getting the quilt finished, it’s a good thing she was over a week late, although not for her poor mother. 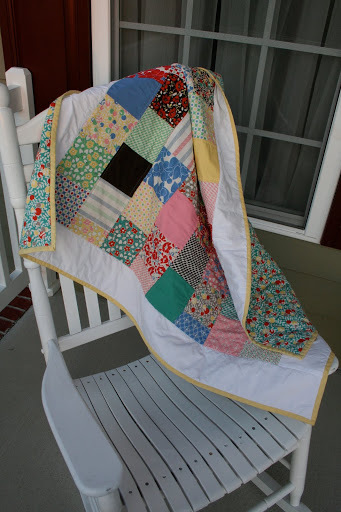 Again, I didn’t know whether the quilt was going to be for a boy or a girl until the baby was born. Zoe’s mom already has two boys so I was hoping it would end up being for a girl. The backing is also from the Hello Betty line by Moda and it has a yellow binding. 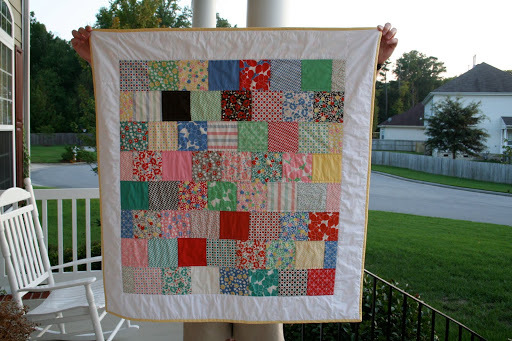 I quilted a 1/4″ from both sides of the horizontal seams and in the ditch around the patchwork. I thought this would be the quilt I tried free motion quilting on but I didn’t have a darning or FMQ foot and didn’t feel like running to the store again, so I went back to the straight lines. In the end, I really liked the modern look of it with straight lines. The pictures aren’t quite doing this quilt justice. It’s a lot more vibrant in person and the backing doesn’t look like digital camoflauge in real life.